Pre- Ice down and/or chill a Martini glass. With a mixing glass (with some ice) pour the Vodka, Pomegranate juice or liqueur with your fresh Raspberries, Strawberries or Pomegranate seeds (you can pre-blend the fruits, btw). 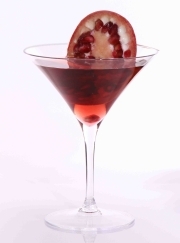 Top-off with your Pomegranate or Lemon wedge garnish.